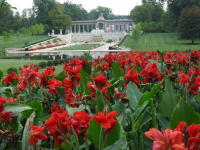 The DuPont Estates are certainly some of the can’t-miss attractions in Delaware. After you’ve seen the highlights, such as the family houses, take time to explore beyond. And a little bit off the beaten path, you’ll find the key to the estate’s gorgeous scenery. At Winterthur Museum, Library & Garden, make your way far western end of the estate. That’s where you’ll find stone steps descending into a sea of flowered color in the Quarry Garden. When you look out from the elaborate mansion out onto the Versailles-inspired grounds at Nemours Mansion and Gardens, the Sunken Gardens are just out of sight. Stroll down the Long Walk, and you’ll end up at this Italian-flavored garden and its stunning grotto. The scenic views of the old gunpowder mill along the Brandywine River at the Hagley Museum & Library are enough for an entire visit. But going to the Eleutherian Mills and the original family home is well worth it, too. Look out the back of that home, and you can see th E.I. DuPont Garden, which was the starting place of the DuPont family’s love of gardening. The focus on plants native to Delaware means discoveries at Mt. Cuba Center can open up a world of beauty. 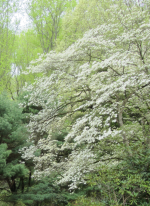 Part of that splendor is the Dogwood Path, a stretch of walk tucked in toward the rear of the grounds that explodes each year in a flurry of white sure to delight.